Every time I log off from my hotmail account, the MSN new page appears. Its an interesting mixture of news, quirky happenings, lifestyle, finance, home etc. A whole package to take care of what interests you. Yesterday I read an article on what things kids of these days miss out on because of technology. Very interesting and I remember there was joy and a sense of achievement too when we used these things because that’s all we had. For example, kids of today probably wouldn’t know how to use a directory. Remember when we had to browse through the phone book to find contact numbers? I remember just for fun we use to see how many Patels were listed in the Kenya Directory or how many Njoroges were in Nairobi. During our trip to Florida we actually opened the directory to find how many Patels were in Orlando. We were missing our khichdi. Of course we didn’t have the guts to call any of the numbers! That’s a different story. Kids of today will probably never experience how to use the dial up phones, you know the ones where we needed to turn the dial with our finger to call. Kids of today hardly ever need to go to the library to do research work. Going to the library every Saturday was a fun activity for me. Going through so many reference books, encyclopedias etc. Kids of today will not experience the joy of recording favourite songs on a cassette tape. We’ve done that umpteen of times. Kids of today probably don’t need a dictionary to look up meanings of words. Today you just type the word on the online dictionary. Watches are more for fashion than telling the time today. Most kids use their mobiles, computers, tablets to tell the time. Winding an alarm clock, getting up ever so often to switch channels on the telly without a remote control are things today’s kids do not experience.They will find all these things in a museum somewhere. Today’s recipe is an orange marmalade which I had been meaning to make for such a long time. Every time I bought oranges they got used up for other things – baking, for juice, salads, desserts etc. So day before yesterday bought the oranges and immediately started preparing them for the marmalade. I had been through quite a few recipes and some appeared so complicated, some needed a sugar thermometer, some were talking about kilos of oranges. For a trial run definitely didn’t want to make huge quantities. So the best was to pick the best from all and make my own recipe which I dare say worked pretty well.Originally marmalade was made from quince fruit, but modern day marmalade is usually made from citrus fruits. The most popular being orange marmalade. The marmalade back then was mostly used in baking and desserts.To read a bit more about marmalade, check out this link. Here is my simple orange marmalade recipe. What other things did you use that kids of today have probably not even heard of? Put a 2 small plates in the freezer.Will explain later why. Wash the oranges well. Using a peeler, peel off the rind from all three oranges. Chop the rind from 1 orange into thin strips. Remove the white part (pith/albedo) by peeling it off the oranges with your fingers. Remove as much as you can as the white part is the bitter part. Cut the oranges into slices and remove the pulp from the membrane and the middle white part. If you prefer a bitter marmalade, then you can leave the thin membrane. I prefer to remove it. Remove the seeds also.As you do this, juice will come out of the segments. Save the juice to add to the pulp. Put the pulp, juice, chopped rind, zest and water in a thick based saucepan. Put the saucepan over medium heat and bring the mixture to a rolling boil. Lower the heat and let the mixture simmer for 30 minutes, stirring it regularly. Add sugar and stir the mixture continuously till the sugar melts. Let the mixture simmer till it becomes thick. Towards the end stir more frequently so that the mixture does not stick or burn. This takes about 20 -25 minutes. Now that frozen plate comes handy… put a teaspoon of the marmalade on the frozen plate. Put it back in the freezer for a minute only. Take the plate with the blob of marmalade out of the freezer. Tip it a little sideways. The marmalade should not drip down. Now will your finger, gently push the marmalade from the edge towards the middle. The skin on top should wrinkle if the marmalade is done. If it fails both tests, let it simmer for a further few minutes and repeat the test. Now you see why we needed 2 frozen plates! Spoon the marmalade into a sterilized jar. Close the lid and let it cool down at room temperature. Once it becomes cool, put the marmalade in the fridge. Sterile glass bottles for the jam, marmalade by putting them in boiling water. Wipe with a clean cloth. Add spices of your choice to the marmalade if you wish… cloves, cinnamon, ginger etc. You can add extra chopped rind if you like. Add lemon zest and juice for extra flavour. Best to use white sugar as slightly brown sugar will change the colour of the marmalade. 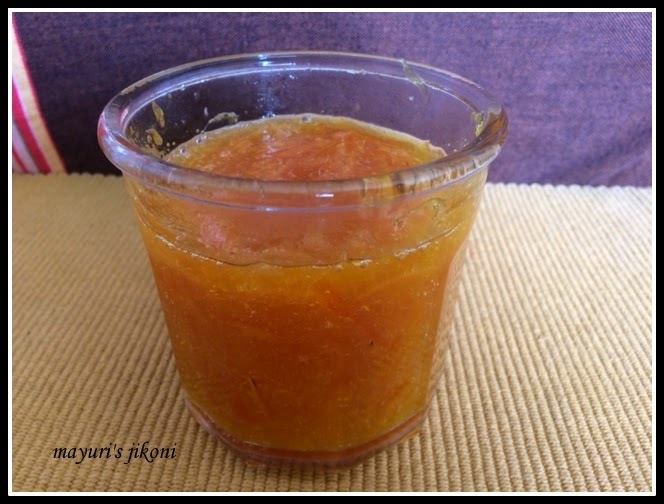 Nice and simple recipe of marmalade. Home made is better any day as we can avoid preservatives . I have always wanted to try making marmalade. This looks so good! Never tried this,u explained easily ..nice..